Stock Ford Y build or modified? Here are two different approaches. 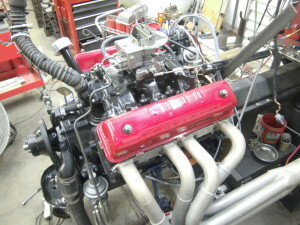 I was recently given the opportunity to rebuild a pair of Ford 292 Y-Block engines with each going into 1963 F100 pickups. While both engines started life out as 1963 two barrel pickup engines, one was a restoration project while the other was to be a mildly hopped up version. The engine for the restoration pickup was to be built as close to stock as possible while the other engine was to use the normal performance upgrades such as four barrel intake and carburetor, larger valved heads, and a better than stock camshaft. The connecting rods are reconditioned with new ARP rod bolts, the big ends being resized, and new wrist pin bushings installed. The replacement cast pistons are fitted to the bores with 0.0025” clearance and sit 0.020” below the decks at TDC after a cleanup mill had been performed on the decks. The static compression ratio for this engine is 7.8:1 while the dynamic compression ratio calculates to be 7.5:1. The rotating assembly is precision balanced using a 2100 gram bobweight value once all the basic machine work was complete. Topping off the engine assembly is the original two barrel intake manifold and the Autolite 1.02” venturi two barrel carburetor. The stock distributor is retained and is upgraded with a Pertronix electronic ignition conversion. 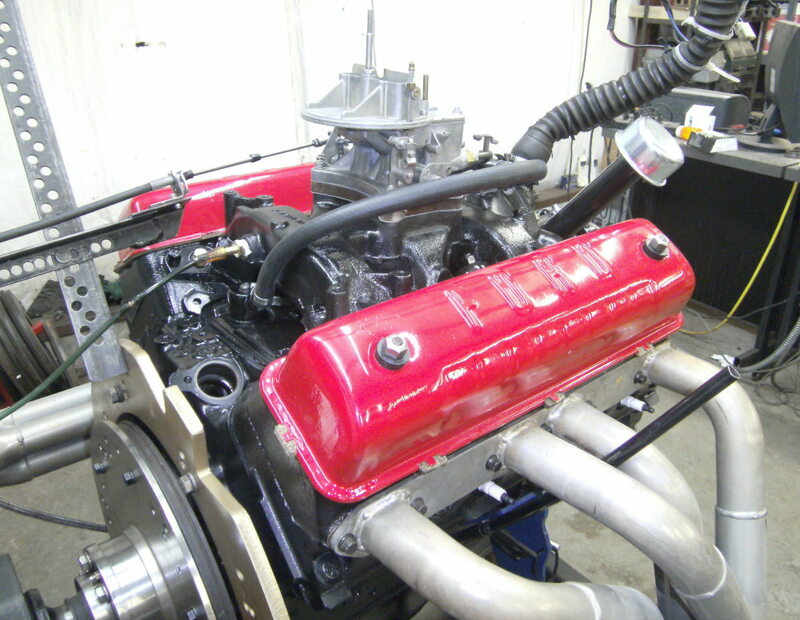 The engine is filled with six quarts of Valvoline 10W-40 conventional oil along with a Wix 51515 oil filter and is readied for running on the DTS engine dyno. After the engine has been broken in on the dyno, the valve covers are removed with careful attention towards any premature valve train wear. There is none so all is good. The valves are ‘hot’ adjusted to 0.019” lash and some power pulls are made to insure that the timing and jetting are where they need to be. 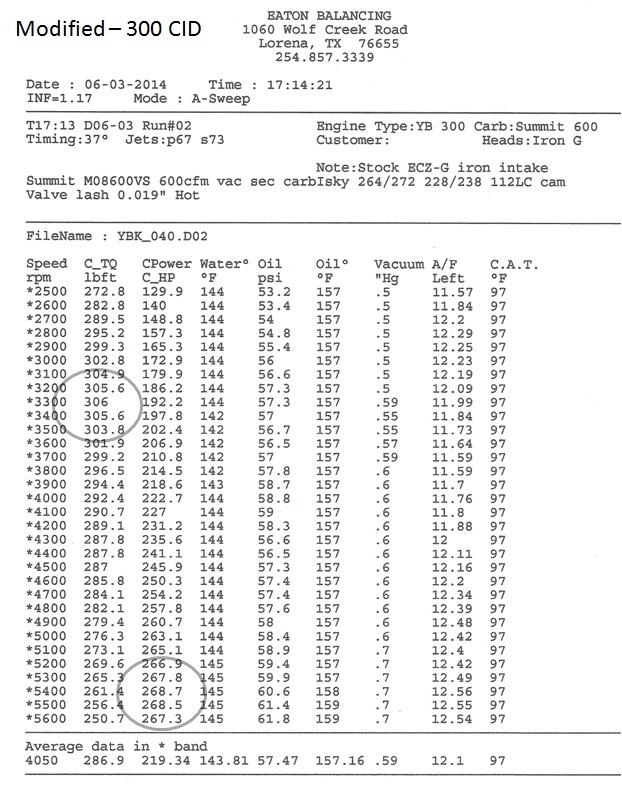 After making minor tuning adjustments, the horsepower peaks at 153 at 3800 rpms and the torque peaks at 267 lb/ft at 2500 rpms. It becomes evident that the original two barrel carb is a major player in holding back any serious rpm capability. On the flip side of this, the engine idles very smoothly and at a very low rpm. I will add that the engine was tested with a set of headers feeding into dual mufflers. The installation of the original crossover pipe with a single exhaust pipe system being used will cut the HP power numbers and torque values back a bit further based on previous exhaust system testing results. 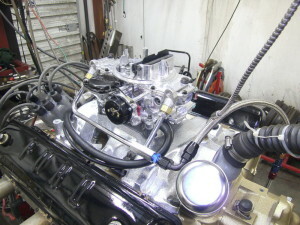 The second F100 engine has the cylinders bored 0.050” over stock thus putting the cubic inches right at 300. The cylinders are sized so that the piston to bore clearance is 0.0035” and the decks are machined so that the pistons are level with the decks (zero decks). A flawless standard journal crankshaft is available so no grinding of the shaft is required in this instance. The connecting rods are reconditioned with new ARP rod bolts being installed and once this is done, the rotating assembly is precision balanced using a 2070 gram bobweight value. The cylinder heads are the ‘big letter’ ECZ-G heads with one of them being posted and the other is not. The heads are rebuilt with hardened exhaust seats and lightly milled with the combustion chambers measuring 69.2 cc’s when all is done. The static compression ratio using the Best Gasket composition head gaskets is 8.75:1 while the dynamic compression ratio calculates to be 7.17:1. This engine will run fine on the lower grades of gasoline if necessary. The rocker arms are the original 1.43:1 units that have been refurbished and mounted on new Schumann rocker arm shafts. The pushrods are oem style tubular units measuring 7.940” effective length. The engine is topped off with an iron ECZ-B four barrel intake and the carburetor selected is a new Summit 600 cfm unit which sits on top of a 1” four hole spacer. 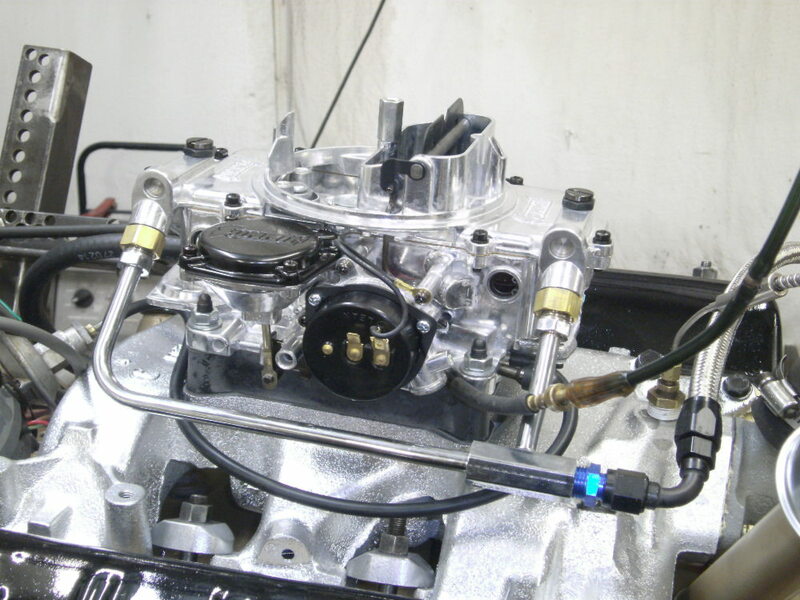 This carburetor is similar in construction and appearance to the older flat top Autolite carbs that were popular on Ford engines in the Sixties. The crankcase is filled with six quarts of Valvoline 10W-40 oil along with a Wix oil filter and readied for run in. After running for a given period of time on the dyno, the valve train is thoroughly checked over for problems and none are found. 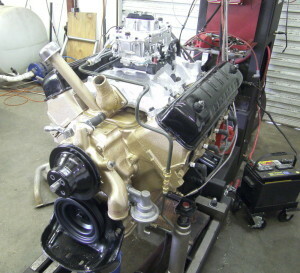 Once the initial tuning is completed, the engine is peaking at 269 HP at 5400 rpms and 306 lbs/ft torque at 3300 rpms. While this engine does exhibit good idle characteristics, the exhaust is still letting you know that the camshaft is no longer stock. So there you have it. Here are two engines that started life out similarly but went two different directions on the rebuilds; one being stock and the other being modified for additional performance. While the stock engine was less expensive to build, many of the extra costs incurred on the hopped up engine was in obtaining the four barrel intake, G heads, and the new carburetor. 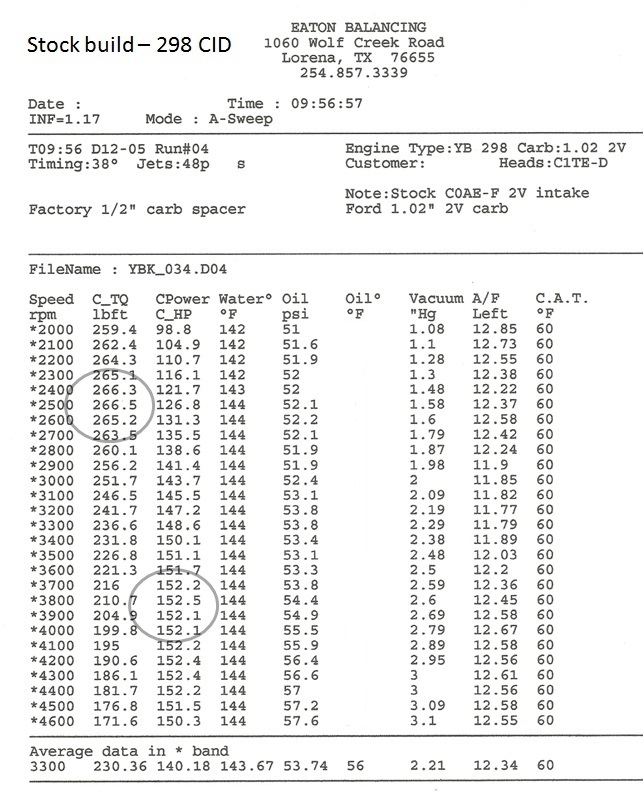 The Isky camshaft is also slightly more expensive than the stock camshaft but the costs for the machine work, pistons, rings, bearings, and gaskets for each engine were very similar. The addition of ECZ-G cylinder heads, ECZ-B 4V intake, 600 cfm carburetor, and Isky camshaft to a stock engine in this case makes for a 76% improvement in power. The stock engine is making 0.51 HP/CI while the modified engine is making 0.90 HP/CI. That’s quite an improvement by just adding the right combination of parts. 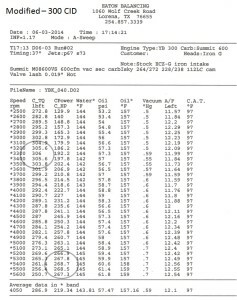 The dynometer sheets for each engine are at the end of this article. 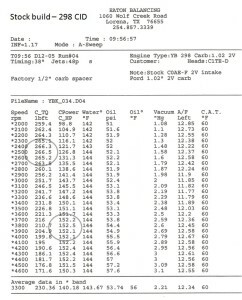 Click on dyno sheets for larger images. This article was originally published in The Y-Block Magazine, Nov-Dec 2014, Issue #125.